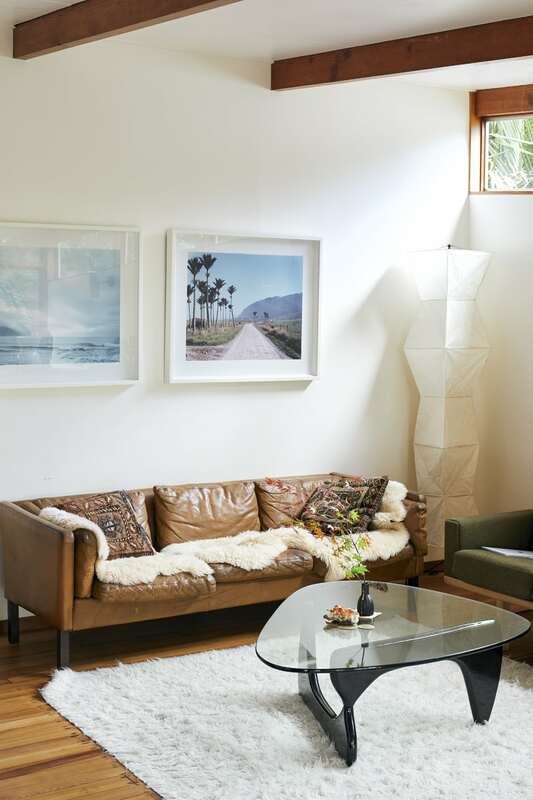 Impressive yet humble, well-considered yet with a view of the wild, this home has a beguiling dichotomy. Fashion designer Mahsa Willis’s covetable garments skilfully strike a balance between form and freedom. She believes there’s an art to knowing what to leave out or take away, and this sense of thoughtful restraint pervades her West Auckland home, too. Mahsa, how did this house come to be your home? 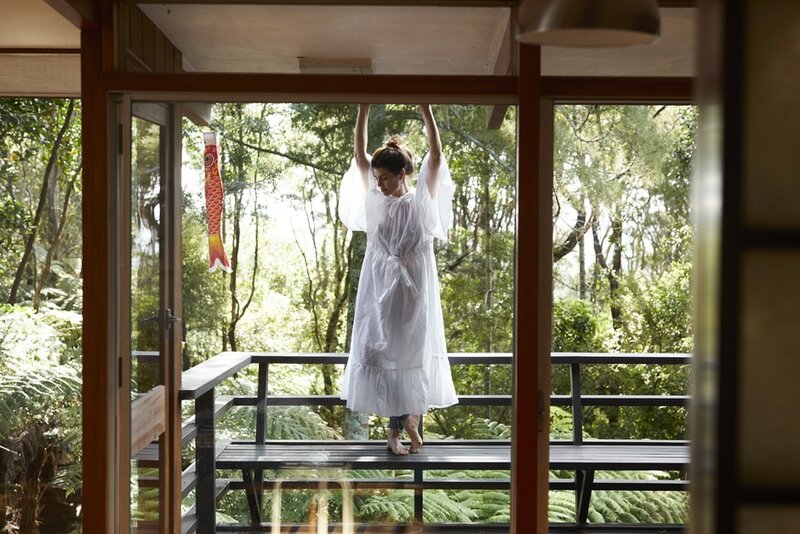 My former partner and I bought our modernist Titirangi tree house in 2013 from the son of architect Ewen Wainscott and his wife Eileen, both of whom are now deceased. 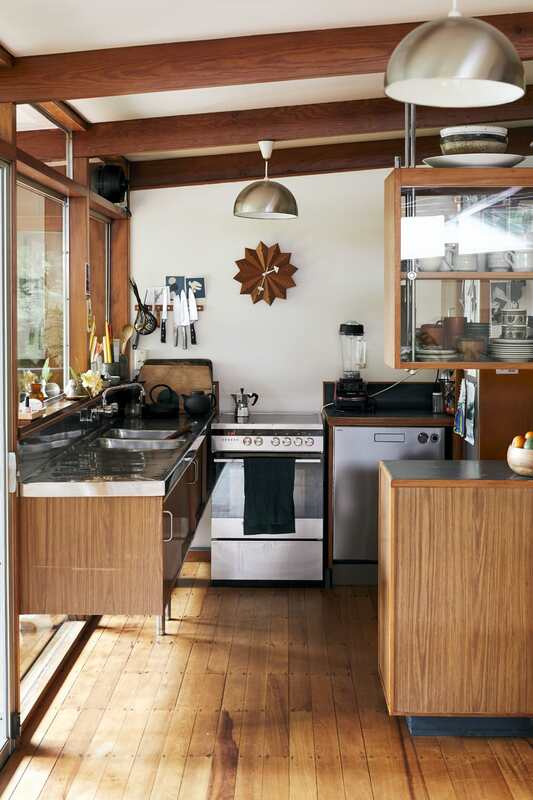 Ewen was Auckland City Council’s chief architect from the late 1960s to 1985, and this was his family home. 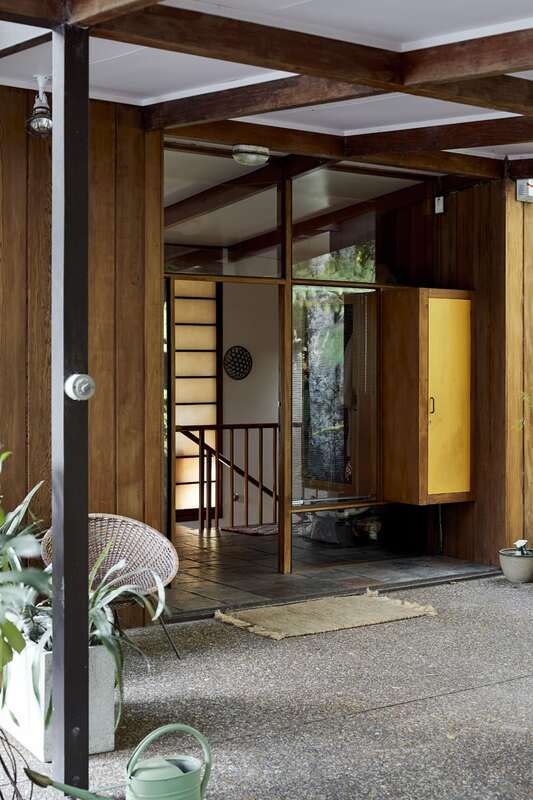 Eileen influenced the design of the house; she was interested in the practicalities of life. My young family connected with it immediately. We needed more space, and wanted to leave inner-city Auckland for a quieter environment. TOP Mahsa (in the O’Keeffe dress from her Yesterday Modern 2 collection) describes her designs as “a textile dedication to a woman’s tenderness, grace and strength. A giftto our sisters, mothers and daughters as a reminder of what has come before and what lies just ahead.”ABOVE A month before viewing this house, Mahsa had read and loved an article about Canadian artist Gordon Smith’s modernist home, which is set in a forest in Vancouver, so when she saw this place, she knew it was meant to be. What attracted you to the house? Firstly, the setting. I started my life in a home surrounded by bush, and in many ways, after years of travelling and living in apartments and villas, moving here has brought me back to where I feel most at home. The house sits quietly and sympathetically in this setting, and its scale and the light make it pretty special. Did you make any changes to it? We did very little – just the essentials. 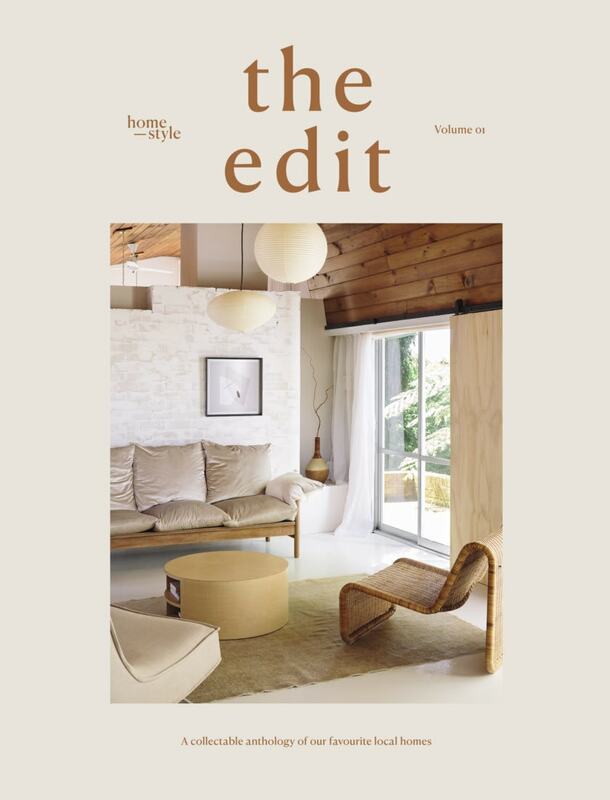 We painted the walls a beautiful warm white; sanded the matai floors; stripped, sanded and oiled the cedar exterior cladding; and put central heating in. I had grand plans for the garden, but then I started a business, and along with my children that has taken up all of my time. Having lived in the house for a while now, I know what I’d like to do, and I will update it eventually, but it’ll be more of a gentle restoration than a renovation. KITCHEN Apart from the appliances, the kitchen is entirely original, with floating cabinetry that adds a sense of spaciousness. 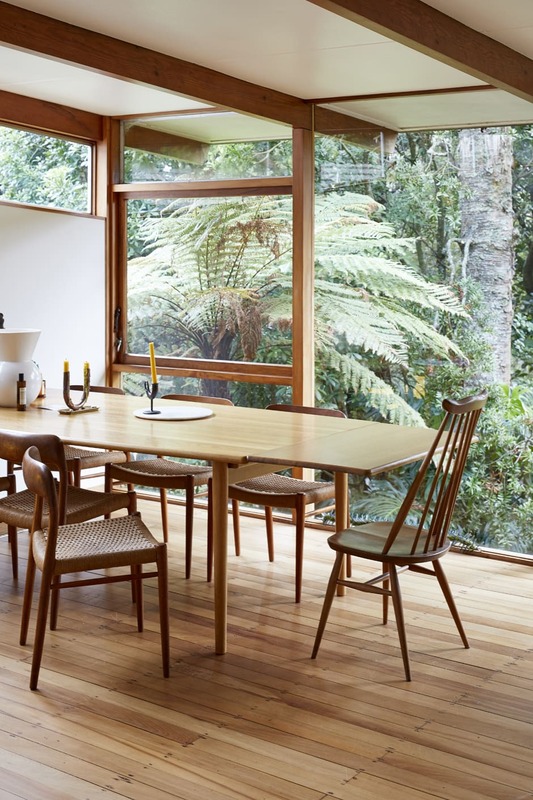 The joinery throughout the house is crafted from rimu timber and the floors are matai. The clock seen here is a Vitra design. DINING Chairs by Niels Otto Møller and Ercol from Mr Bigglesworthy gather around the dining table, which is another Niels Otto Møller design. The Bulb vase on the far left is by Gidon Bing from Good Form. What do you like most about living here? I like the serenity: the stillness of the night air, the sounds of the bush, the sunlight and shadows that dance across the house. And my lovely neighbours. 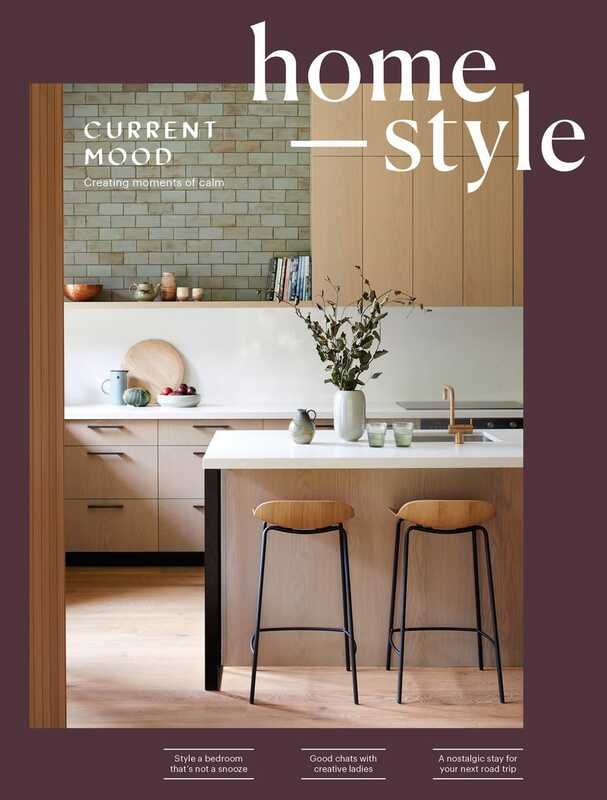 Utility and romance are themes you draw on for the garments you make – do they apply to the way you ‘dress’ your home? Yes – I like juxtaposition. I find the house poetic and rustic, so adding modernist pieces to its interior makes it ‘sit up’ and adds to the enduring atmosphere. Everything for me is intuitive and mood-driven – and I live by that. If an object makes me feel something special, I enjoy living with it. I also like layering different textures in the house; I don’t like anything too hard-edged and serious, especially in winter. What has shaped your taste? My unconventional upbringing, growing up around makers and a mother who always wore something textural and interesting; and having a glamorous grandmother with an amazing eye for tweed, cashmere and porcelain – she drove a racing-green Triumph at one point. I’ve also been influenced by my travels, living in London and Amsterdam, my friends with very good taste, and some of the incredible creatives I admire and follow, like photographer Leslie Williamson. Having my own family has informed how and why I need certain things, my lifestyle and my interest in form, function and comfort. This house must be a lovely restful place in which to create – do you like to work from home? Sometimes my house is so mesmerising from an outward/inward perspective that I don’t get work done! I find myself studying the light and shadow play. I’ve always loved natural light, waking up at dawn and then seeing the sun set; being present in these moments makes me feel alive. One of the most popular colours in my collections has been jungle green, and this house and the landscape were hugely influential in that. ABOVE A picture window in the master bedroom frames another beautiful view of the bush. 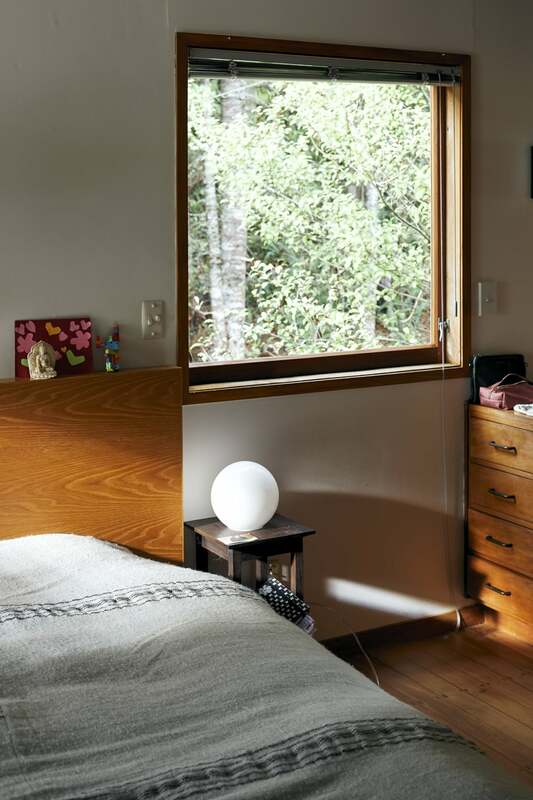 The Bulb lamp is by Minimalux from Simon James. What things in your home do you hold dear? Everything has a story. I like the mixture of old and new – recent finds and pieces I’ve acquired along the way. Editing and finding that I actually enjoy having less has been a big discovery recently. What everyday rituals do you enjoy? So many – some romantic and some not so romantic. Waking up in my bed with my two children and our dog and looking out the windows to the bush; the kids bringing me in some magical coffee made the old-school way; hearing the kids and the neighbours’ kids playing outside, and tui during the day and ruru on summer nights; sitting on the deck in the summertime. They’re all simple rituals, nothing more.